The surgery was opened in June 2012, having previously been empty for a while. I full refurbishment programme was completed before opening. The building is fully air conditioned with an advanced ventilation system to circulate fresh air throughout the building without having to open the windows. 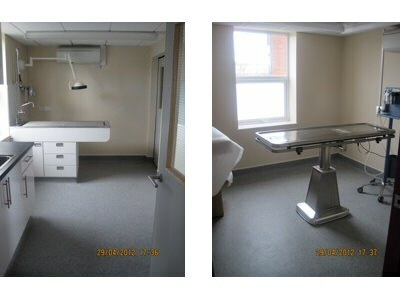 It is fully equipped for surgical procedures, and has a digital xray set up and ultrasound in a fully lead lined room. The surgery is open Monday to Friday between 9.00am and 6.30pm, and on Saturday between 9.00am and 11.00am. The consulting hours are listed below. If you wish to speak to the office staff, make an appointment, or have a non-emergency question for one of the vets please call during the opening hours. There is emergency 24 hour cover when the surgery is closed. The Centre is on the A25 between Godstone and the A25, A22 roundabout. Heading from Westerham you will go past the Farm Shop on your Right, and the Centre is about 300 metres further on, on the Left. Come down London Road from the centre of Westerham. Go past the Industrial Estate on your right and 150 metres further on the right is a turning called Madan Road. The surgery is on the corner of London Road and Madan Road.